Disney Channel’s Zenon: Girl of the 21st Century is celebrating its 20th anniversary today. Loosely based on the children’s book series by Marilyn Sadler, the Disney Channel Original Movie stars Kirsten Storms as Zenon, a teenage girl from the year 2049 who’s spent most of her life on a research station in space. After uncovering a dangerous plot by the space station’s owner, she’s literally “grounded” and sent to live with her aunt on Earth. There, she learns about cute boys, ponies, and onion rings. Oh, and how the privatization of space programs will lead to nothing but disaster and death. The pigtailed revolution has begun. In space. To commemorate the anniversary, I spoke with one of the film’s most-infamous personalities: Phillip Rhys, who played the rock star Proto Zoa. Known more recently for starring on Syfy’s Nightflyers, the upcoming Pretty Little Liars spinoff, and the “Husbands of River Song” Doctor Who special, Rhys still looks back fondly on the movie that made him a household face among tween girls (13-year-old Beth Elderkin would be having a field day if she knew this interview was on the horizon). 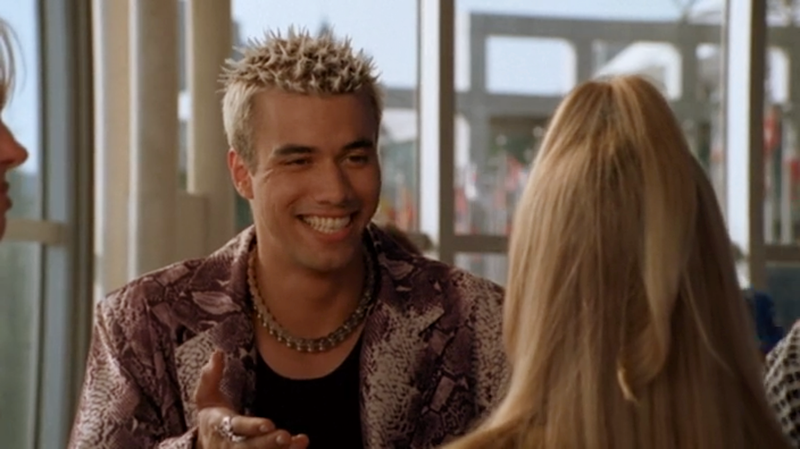 According to Rhys, Proto Zoa was just one in a number of musicians he’d played that year, saying that when you’re “in your 20's and you have an English accent, you get kind of typecast.” Of course, Proto Zoa wasn’t just any rock star, he was a space rock star from the future, with spiky bleached hair. Rhys said the blonde hair was a leftover from a previous role, inspired by the characters in Trainspotting, but Proto Zoa was an enigma all his own. “He’s a bit Bowie, he’s a bit Elvis, he’s a bit Liberace,” he said. However, there is one thing Proto Zoa definitely isn’t: a good dancer. Rhys said the biggest hurdle in playing Proto Zoa was the final song and dance number, to the now-infamous “Zoom Zoom Zoom.” The original dance, orchestrated by Michael Jackson’s choreographer, was a fun and complex rock star romp. But Rhys...couldn’t quite get a handle on it. Proto Zoa’s hair is looking slightly less spiky on Doctor Who. Zenon and its Zequel, which Rhys also performed in (he was replaced for the third film due to scheduling conflicts), may be decades old now—but Rhys has stayed a strong presence in the realm of science fiction. More recently, he was Murphy on Syfy’s Nightflyers, but he also played Ramone on the 2015 Doctor Who Christmas special, “The Husbands of River Song.” That one was definitely a favorite for him—not only because he’s a huge Doctor Who fan, but also because its human-focused stories are what he loves the most in science fiction. Strangely, that kind of brings us back to Zenon. It might have been a silly movie for kids about a girl who lived on a space station, but it was also surprisingly grounded—a character-driven “fish out of water” story about a girl learning to make the best of a bad situation and fight for the people she cared about. And, as Rhys pointed out, it also capitalized on a critical time when technology was changing rapidly, and kids were learning how to change with it. The movie basically predicts iPads, GoPros, and Elon Musk—even if it still thought solar-powered cars were the way of the future. No matter if the technology has become dated, or the pop culture references (though “President Chelsea Clinton” still makes me hopeful), it’s still a stupidly good time.